Safety isn’t just business to Mike Ellenbogen, it’s personal. Ellenbogen recently took his 17-year-old son and some of his friends to the Boston Garden for a concert, not long after the Las Vegas shooting, where 58 people died and 851 were injured. 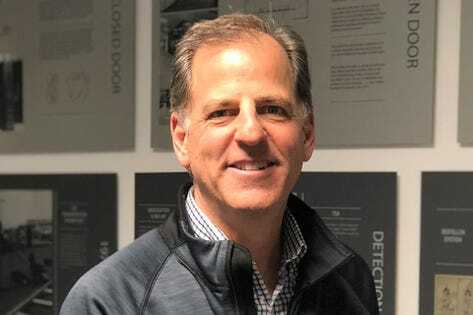 Ellenbogen, CEO of Evolv Technology in Waltham, Massachusetts, has worked in security, primarily for aviation, for nearly 25 years. “Physical security is in my blood,” Ellenbogen said. Ellenbogen started thinking about how to bring aviation-type security to the places people go every day – train stations, sports stadiums and office buildings, for example. The thing is, nobody wants to wait 45 minutes in a line to get into a stadium. Truth be told, people don’t want to wait 45 minutes to get on an airplane, but they have no choice. The Evolv Edge scans you as you walk through it for firearms, explosives or other weapons, and identifies you through face recognition – all in an instant. If you are a threat, your picture will come up on the screen of a nearby security guard, with a color-coded box identifying the part of your body where the threat exists. “If you’re carrying a gun on your right hip, there will be a box on the right hip so the guard knows eactly where to look,” Ellenbogen said. Ellenbogen founded Evolv five years ago, taking the first three years to develop the technology. He started shipping the Edge at the end of 2017, and already has hundreds in place, he said. In Brussels, Ellenbogen said, they’re using the Evolv Edge at the front door to protect the terminal itself. Which means there may be an Evolv Edge coming to a venue near you soon.